When Ubisoft released Assassin's Creed: Origins, late last year, it was a title that broke free of a few Ubisoft gameplay traditions. It certainly made substantial strides in regards to refining its gameplay, but it still contained many elements that people have come to expect from a typical Ubisoft release. Far Cry 5 also follows this same path of offering a game that feels familiar but makes some very clear changes that look to refine what has come before it. Far Cry 5 is still very much a Far Cry game in every sense of the word, but exploring its open-world and interacting with it has never felt so good. Now, if only it had a satisfying story to tie it all together. Far Cry 5 takes place in Hope County, a fictional location set in the state of Montana. You are a rookie Deputy who is joined alongside fellow law enforcement to take down a religious zealot named Joseph Seed, known to his followers as "The Father". The game would be a very uneventful one had this mission gone as planned and before you know it, you are running away from the burning wreckage of your helicopter being pursued by Joseph's followers. It's not long after where you'll encounter a few resistance members who make you aware that Hope County is split off into three regions, each policed by a sibling of Joseph. The focus of the story from then on out is taking down each of these three leaders in order to track down and lure out Joseph. Your interactions with Joseph, and his "Heralds"; John, Jacob, and Faith, are mostly through cutscenes and a final encounter as you take back each of the three regions in Hope County. While you are treated to a few cutscenes depicting their various recruitment tactics, I just never found them engaging, or remotely interesting. While the Faith character starts to show a few cracks in her facade, they never really fully explore it and she ends up being just as two dimensional as her 'brothers'. The boss encounters themselves are somewhat hit and miss as well, as I only liked the final clash with Faith, and that of the Father himself, despite the lackluster ending. As you tackle missions and side quests, as well as the smaller random events around the County, you will earn progression milestones towards brief encounters with each of the Seed Siblings. These moments are usually based around you escaping or attempting to free one of their captives, people you are meant to care about, but it's mostly someone from the start of the game you spent all of five minutes with. There was also a lot of discussion on the subject matter contained in Far Cry 5 with its use of religion and politics. I am neither deeply religious or politically minded, so much of this is lost on me. I'm not usually one to contemplate themes and messaging in games and usually, most of it goes over my head. However, I can totally see the themes of Christianity used in several aspects of the cult, especially in its marketing, but I never felt that the game became offensive at any point during my time with it. While we are told many times that the cult featured in the game is bad, there are moments where the 'good guys' seem to cross that line as well, creating a few moments in the story that don't seem to be fully explained or explored. Games that deal with tense themes like religion and politics, especially in this day and age, usually have to be careful in how they tackle such delicate subjects, but for as much discussion around this that there has been, Far Cry 5 seems to avoid direct discussion about these topics in their game and mostly just dance around them. The territory based objectives reminded me a lot of Ghost Recon: Wildlands, where no matter the amount of carnage and destruction you left in your wake, the other factions were completely oblivious of your progress and this can make the world feel very small. This is usually the problem I have with large open-world games where the story is rarely consistent and usually not affected by your progression until the final area. I would have loved to have seen some narrative change to the story based on which sibling you took out first, and missions where you interact with each of these characters outside of cutscenes. The world created here seems ripe for far more than what is offered and much of the design around limiting these interactions to cutscenes can make large portions of Hope County feel isolated and hollow. While I criticize the use of cutscenes for nearly the entirety of your interactions with these characters, There was one in particular that really stayed with me. This is a moment where John wants you to meet him in the church, and the scene that followed actually made me cringe and look away. It was a powerful moment that I really wished the game tried to top for the remainder of the campaign. While nothing else ever did reach the quality of that moment via the story, it was the side quests and support characters that really eclipsed anything found in the main narrative. These missions are fun, crazy, and made Hope County a true marvel of exploration. The central cast of allies that you come across are vastly more impressive and far more fleshed out than any of the cult members. Nearly every character has some score to settle with at least one sibling, and often are those who have been fighting the good fight for quite some time. As you trek across the open countryside of Hope County, you can enlist the help of six characters from the resistance to fight alongside you. While you can have a total of nine potential followers, the remaining three sidekicks are reserved for Boomer the Dog, Cheeseburger the Bear, and Peaches the Mountain Lion. Each of your followers will have some sort of quest to take on before you can request their assistance in taking out the Project at Eden's Gate cult. These missions are wildly entertaining and the fact that these characters are right there alongside you really goes a long way to make them interesting. Once you are able to enlist the help of two characters at a time, the banter between certain followers was enjoyable, often hilarious, and had me switching out team members to hear all the possible conversations. There is a line delivered by Jess towards Peaches that made me laugh mainly because I wasn't too sure if I had heard her correctly, but it turns out I did. Apart from the varied and wonderful personalities of your fellow companions, they can offer a wide range of perks and bonuses that make them an asset to have with you. While I love sending Jess or Grace out to clear an Outpost in seconds, you can have Nick provide a strafing run from his plane, or request a chopper from Adelaide. Apart from the human interaction, it can be insanely fun to watch your pet bear tear apart an encampment in seconds or listen to a cult member run away from Boomer because he's allergic to dogs. The wide range of possibilities to your companions and their impact on your combat can be extremely satisfying. Apart from the nine fleshed out named characters, you can also enlist up to three random residents, each sporting various weapons and can often produce some laugh out loud moments like having one who is obsessed with rocket launchers opening fire on oncoming cult vehicles or a single guard at an outpost. The side quests themselves are also well thought out and engaging. Whether it's the quests to earn the support characters themselves, using a rocket launcher to destroy a giant statue of The Father, testing out a drug-fueled obstacle course, or teaming up with a Secret Service Agent to locate a certain 'tape' from the Russians, I was never bored taking on these bizarre and addictive activities. Far Cry 5 plays host to a wide range of fun events that while hilarious, can provide an incredible amount of freedom in the chaos you can unleash. Much like in Skyrim, you can pick a direction and just wander off the beaten path, finding adventures and quests as you go. 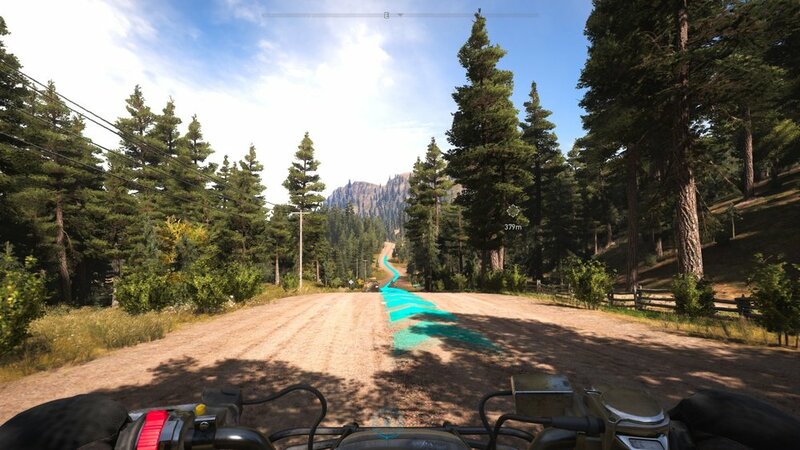 The amount of freedom you have in Far Cry 5 feels far more palpable now that Ubisoft has decided to drop the mini-map and eliminate the usual icon-filled open world. While losing the mini-map may not seem like a massive change, it really feels like a substantial one. Most locations are not marked or indicated on the map until you stumble upon them and this can make exploring feel rewarding in a way that I never felt before in the series. As you make your way around Hope County, you will come into contact with several dynamic events or smaller quests called Prepper Staches; small vault-like locations packed with money and collectibles. Prepper Staches became something of an obsession for me as seeing their teal diamond icon on the map had me drop anything I was doing in order to track them down. Other events are liberating Outposts, freeing captive residents from the side of the road or those trapped in cult vans, or getting behind one of the many vehicles and ripping through timed checkpoint races. Outposts are some of the best content in the game but I often felt they lacked a solid amount of guards to take down. Most locations have maybe 5 or 6 cult members and when you attempt to take them out quietly with your bow and fellow stealth companions, you can usually drop a base in less than a minute. I would often go in guns blazing and have them signal for backup, having more guards show up by the bucket load and this form of chaos is usually where the game is at its best. The Clutch Nixon events, which are the time trials, were events that I just didn't care for due to the twitch nature of some of the vehicles. I lost track of how many of the events I lost, at the last second, due to my vehicle hitting the side of a mountain or steering into a tree that seemed intentionally placed to block you. While I admit that it's mostly my skill to blame, I just couldn't get excited about these events. I've glad they are there to provide additional content for those who do enjoy them, but they were not my cup of tea no matter how outrageous they truly were. There are certainly some aspects to Hope County that I wish I saw more of. The small community of Fall's End has a dive bar called The Spread Eagle. It is one of the few locations in the game where people seem to be getting back to a sense of normal and not standing guard outside an outpost or taking random drives or walks around the County. It is this small location that offers a glimpse of these people wanting to just get back to a normal life. The remainder of Hope County can often feel exciting and adventurous, but lifeless at the same time. While you can play the entire game solo or with a few companions, you can also jump into or have another player join your game. This, however; comes with a huge caveat. Having a player join your game will allow them to take part in whatever mission you have prepped and ready to go but it will not save any story progress for the joining player. They will save what weapons and outfits they unlock and the progression they make with their skills, but that is it. This didn't ruin co-op for me, but it certainly was a turn off for my friend who wanted their progress to truly mean something. While this type of restriction is good for games that have choices and consequences, it feels somewhat like a missed opportunity here to really let co-op shine. Whether it's behind the turret of a vehicle as your companion races to your waypoint or flying over a cliffside on an ATV, the vehicles, when you don't have to worry about exact precision, are incredibly fun to just rip around the countryside of Hope County. You'll have cars, trucks, vans, buggy's, semi trucks, ATV's, helicopters, and for the first time in the series, planes, to have available to cause as much chaos as you can. While there are variations within each type, these variants are usually just a cosmetic skin that doesn't offer any other differences than a simple paint job. While the helicopters are a joy to take into the air, I found the plane to plane combat to not be entirely satisfying and frustrated me to no end during one story-based encounter. The majority of your time is going to be dealing out some good old-fashioned justice with a wide assortment of weapons. Regardless of it being up close and personal with a shovel, or from a distance with the MBP .50 sniper rifle. The arrangement of weapons that you will equip will dictate not only your preferred playstyle but the types of encounters you will have. Taking a base silently with the Compound or Recurve bow will yield different results than storming an Outpost with the M-79 Shark Shooter Grenade Launcher or the RAT4 Rocket Launcher equipped with Cluster Rockets. Most weapons will have skin variants, but they don't offer any differences than the plain jane alternates. At first, you can only hold two weapons, but after leveling up your skills, you can hold four, ensuring you always have a weapon suited to the task. The satisfaction from this assortment of weapons cannot be understated as nearly every encounter, stealthy or not, is blissfully fun. To further add to the carnage that you bring with you are the addition of throwable items like grenades, proximity charges, and dynamite. You will create most of these items through a crafting system that feels far too basic to serve any real purpose. You'll collect various bits and pieces as you search Outposts, cabins, or just random campsites around the area. You can also craft drug enhancers that will boost your strength, speed, and durability. As you complete tasks, events, complete challenges or procure skill point magazines, you will accrue skill points to spend on perks. Perks reside in five different categories; Survivalist, Renegade, Assassin, Prepper, and Leader, with the latter being perks related to your companions. Survivalist is based on the collection of resources and your ability to take damage. Repairing vehicles, unlocking your wingsuit, and speeding up a particular weapon's reload speed fills out the Renegade path, while the Assassin's perk tree is based around safecracking, crafting, and unlocking the grappling hook. Finally, Prepper allows you to hold more ammo, throwable items like dynamite and grenades, and also the skill tree that will let you equip more weapons. For the first time in a Far Cry game, you can create a character from a fairly simple character creator. I did my best to create a redneck version of Game of Throne's Natalie Dormer, complete with the partially shaved hairstyle she's been known to rock. You can outfit your Deputy with a fairly wide assortment of gloves, shirts, jackets, pants, and headwear. Complete outfits sets are possible as well and while you can buy most of them at any time, there is usually a way to unlock them through activities or special live events. Much like weapons, you can spend real-world money to speed up unlocking these items, but I never felt the need and you can usually find some of that currency in an Outpost or two. Once you are done with the main campaign and worked your way through all the activities and challenges, a feat I am so close to completing myself, there is an online component to Far Cry 5 called Far Cry Arcade. This mode is based around creating and downloading custom maps and activities built by the community. While there are special maps made by the developer, the real appeal of this is seeing what other players have come up with. While not all maps are winners, many of them show real promise and deliver on the what the appeal of a mode like this should have. What is really interesting about Far Cry Arcade is that you can earn money and skill points to use in the main campaign. Far Cry 5 is an extremely good looking game and my entire time with it was spent on an Xbox One X running the game in native 4K at 3840x2160, whereas the PS4 Pro follows in a close second place at 2880x1620. It's worth noting that the base Xbox One version does come in last place as the basic PS4 does outperform it by a somewhat noticeable degree. The main differences between the PS4 Pro and Xbox One X version are mostly in the degree of detail to the texture quality as the PS4 Pro version is noticeably more blurry when compared to Microsoft's newest hardware. For those on PC, you clearly are going to get the best experience as the game can support up to 8K resolution, should you have the beefy hardware to do it. All the praise for the Xbox One X version aside, it is the only version of the game, that I am aware of, that has some odd screen tearing on the map screen that is incredibly noticeable. For a much deeper look into the console versions, I suggest checking out Digital Foundry's comparison video. All those numbers aside, Far Cry 5 is gorgeous. The bright outdoors of Hope County is one of my favorite open worlds yet and easily the most realistic one I've ever seen in regards to item placement and design. Stepping outside during a bright day will blind you until your eyes can focus, and the lighting and shadow work is great, even if your own character doesn't cast a shadow. The texture quality is simply breathtaking with the smallest details remaining crisp and sharp no matter how close you to get to them. While this all takes place in one central location, the variety within Hope County can be intentionally subtle to make it all remain cohesive. That being said, it is extremely easy to be aware of what region you are in due to its surroundings. Whether it's exploring a cabin deep in the woods, skipping across the water at full speed on a jet ski, or launching cows into the air while on fire, Hope County is a visual treat that never stops delivering. Far Cry 5 has a massive soundtrack that features a wide assortment of licensed music as well as several original tracks that are based on the landscape of turmoil that plagues Hope County. These original tracks can provide a lot of insight into the cult, the resistance, and how messed up Hope County actually is. The voice acting is remarkably well done and apart from a few lines of dialogue being repeated again and again, there is nothing here that doesn't impress in some fashion. Ok, so apart from the main story not really impressing me, I've been pretty glowing on the combat and explorative systems in Far Cry 5, but let's dive into the issues regarding polish, or rather a lack thereof. I've had numerous issues where my online partner isn't able to see my vehicle and from their perspective, I'm just standing in place and flying around like Iron Man. I've had numerous issues with falling outside of the map, or bosses getting stuck inside the geometry and remaining invincible unless I reload the checkpoint. I've had hundreds of people consistently run out in front of my vehicle while flying down the road, or enemies just flat out blinking out of existence while I had them in my scope. I've had quest markers disappear, animals fly into the air when I attempt to skin them, and my AI partner remain seated while our vehicle is sinking to the bottom of the lake. Currently, a problem that is plaguing a lot of players is the night cycle not ending, plunging their game into a permanent darkness, as if daylight was a myth. While these issues can be patched, several of them currently can ruin your experience to varying degrees. I'll point out that this is a fraction of the glitches I have encountered or seen via Youtube videos or just casually chatting about the game with co-workers. My biggest issue with the game is one that is intentional, and that is the forced situation of your character being kidnapped or passing out when you hit certain resistance milestones. These are moments when the leader of that region will send out his men to grab you, or your character passing out from an overexposure to Bliss, a drug found everywhere in Hope County. These moments can happen at any point when you hit those milestones, which can be reached when completing certain quests or saving random civilians on the roadside. I've passed out while flying in a helicopter or taken hostage as I am about to collect my rewards from a Prepper Stache, no matter if I had to hike all the way up to the mountain to locate it. These moments do end up delivering some excellent gameplay moments, but the way they force you to drop everything your doing, against your will and take part in these moments just didn't sit right with me and caused me to hate the way Ubisoft chose to tell portions of their story. Far Cry 5 may not have an interesting or captivating main story, but what has been created around it is so much more enjoyable regardless. I enjoyed just picking a direction and heading off to combat whatever came my way, or setting up my team to storm an Outpost in the thick of night. Whether it's helping characters discover alien artifacts, or chatting with a character about how he would rather kill himself than work on another Far Cry game, there are so many fun and interesting side quests to take part in. I enjoy interacting with the resistance members you encounter or even just watching a resident of Hope County get consistently mauled by a Cougar was something I still find myself cracking up just thinking about it. Far Cry 5 is exactly this; a series of fun moments and encounters. This is where the title excels, and Far Cry 5 has crafted a truly breathtaking open world where you parachute out of a plane to have it crash into a cult outpost or flinging a giant grizzly bear off a cliff with nothing more than a smiley face painted shovel, while of course tripping out on some sort of drug enhancers. publisher - ubisoft entertainment sa. far cry 5 WAS PURCHASED BY THE REVIEWER.